Sunday brunch, or any-morning brunch, is better with warm, golden waffles. Crisp and light and scented with vanilla, waffles are the shape of a perfect breakfast, cupping pools of melted butter and maple for a lavish start to the day. Even though there's always a place in my heart for frozen Eggos, nothing beats the taste of homemade waffles, and making your own lets you skip the busy brunch rush. A great waffle iron and Stella’s recipes for buttermilk or yeasted waffles make homemade waffles a cinch. We rigorously tested the top 12 models ranging in price from $20 to $125 (at the time of testing) to find you the ones that consistently make the best waffles—ones that are crisp and golden on the outside while still fluffy and moist on the inside, ready to mop up country gravy, runny yolks, or warm maple syrup. We want waffle irons that reheat quickly so you can feed a crowd. We also want ones that are easy to clean, store, and operate. Because waffle irons are bonus, luxury appliances, we’ve found winners that we’re confident are worth the splurge (and counter space)—tools you’ll want to reach for any time of day. For those who don’t want to spend a lot, we’ve also picked our favorite budget models; they don’t work quite as well, but, with bonus features like removable plates for easy cleaning, we think they’re worth considering. If picture-perfect waffles are a must-have, then this flip model is the pick for you. The flip function makes it easy to distribute the batter from edge to edge, without worrying about overflow. The Cuisinart waffle maker heats up and cooks waffles fast, producing a crisp outer shell and fluffy interior. Its heavy plates heat evenly and retain the heat well, so batch after batch of waffles turns out consistently browned. This iron quickly makes two large waffles at a time and reheats rapidly, so it can handle a lot of growling stomachs. This model also features an on/off switch, allowing you to always have it set up on your counter for waffles on the fly. This waffle iron was the priciest of the units we tested, but the waffles that it produced were so evenly browned, so delicately crisp on the outside while fluffy on the inside, that we believe it's the best option for Belgian waffles. This All-Clad model features extra-deep divots, for Belgian-style waffles with maximum butter and syrup capacity. It makes two waffles at a time and contains a drip tray for minimizing spills and messes. 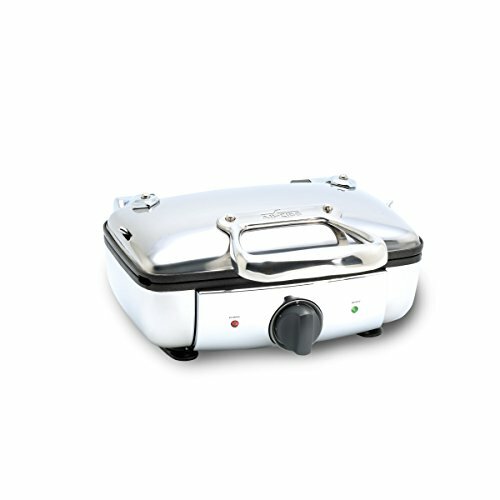 The heavy stainless steel body and die-cast plates heat up fast and evenly for consistent browning. The Breville quickly produces crispy brown waffles, with the most consistent color of all the batches we tested, making it the best option if you prefer the thinner type of American waffle. The waffles managed to be perfectly crispy, without becoming dry, and maintained some fluffiness within. Although it makes only one waffle at a time, it reheats and cooks rapidly, so you can crank out waffle after waffle with ease. The built-in drip tray, nonstick surface, and minimal design keep cleanup effortless. 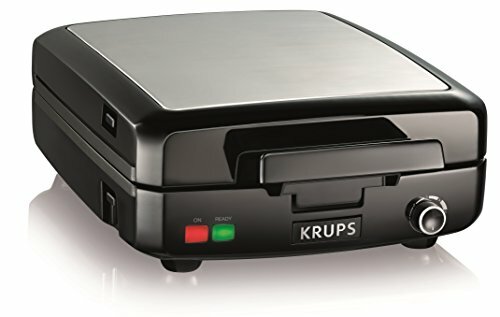 With its large cooking surface, the affordable Krups waffle maker is the best for feeding a crowd on a budget. It has a large enough capacity to make four waffles at a time, but still tucks away easily, with locked handles for upright storage and a cord that coils away underneath. The removable plates are dishwasher-safe, making cleanup quick and easy. If you’re tight on space and money, the Black+Decker offers the most bang for your buck for thin, American-style waffles. It produces waffles that are thin and crunchy on the outside, with some chewiness on the inside; it makes four square waffles, with shallow wells, at a time; and its reversible plates and adjustable hinge convert it into a panini press for toasting thick sandwiches. The unit also opens up to lie completely flat as a griddle for eggs, pancakes, and more, making this a cheap all-in-one breakfast station. The plates are fully removable and dishwasher-safe for fast and easy cleanup. There are countless styles of waffles, including the light and crisp Italian gofri, the sugar-speckled Belgian liège, and the charming, heart-shaped Scandinavian vafler. For our testing we decided to limit ourselves to the two most common waffle styles in the United States, broadly divided into the "American" and "Belgian" categories. Although there are dozens of varieties of "Belgian" waffles alone, for marketing purposes, thicker waffles with deeper wells are considered Belgian, while shallow, thinner ones are categorized as American or "regular." Both American and Belgian waffles can be made in either a circle or a square shape, so it’s up to you to decide which form is more waffle-y to you. The mechanisms of all stand-alone waffle irons are pretty much the same, and relatively unchanged from those of their stovetop predecessors. Traditional waffle makers consist of two molded cast iron plates connected by a hinge, and feature a long handle to keep your hand out of the heat. The iron is preheated over a stove before the batter is added, and the waffle is manually flipped. These traditional styles work well, but they require some coordination on the cook’s part, as well as attention to heat regulation. Electric waffle irons are made of two plates similarly set into a hinged body, which is heated through electric coils housed in the unit behind the plates. Some of these electric waffle makers have basic plug-and-play designs, while others offer variable heat settings, timers, and indicator lights telling you when your waffle is ready. For this review, we looked only at electric waffle makers and excluded stovetop waffle irons, since success with the latter has more to do with the cook’s skill and the heat source than differences in design. Our goal was to determine which waffle irons offered consistent results with minimal effort, even heating for uniform browning, and a short reheat time so you can tackle waffles for a crowd. We also wanted waffle irons that were easy to clean, store, and handle, so you’ll want to reach for them over and over again. First, we have to identify what makes a good waffle. Regardless of whether you prefer your waffle light golden or dark brown, it should be crisp on the outside and light and fluffy on the inside. We always want a waffle that’s evenly cooked, free of burnt centers or pale edges; it should also be the same color on both sides. The key to achieving this is a waffle maker with coils that get hot enough to quickly cook the waffles, coupled with heavy plates to better retain the heat. A waffle iron that gets and stays hot can cook the batter surface more quickly, setting it into a crisp shell while keeping the inside moist and light. Waffles that take too long to cook end up dense, flabby, and leathery. We found that the best waffles were cooked in under four minutes. We made several rounds of waffles, using three different batters, in each of the models being tested. We took note of how long they took to heat up, to cook the batter, and to reheat for the next batch of batter. We also judged the taste, texture, and appearance of the resulting waffles. For our first round of testing, we made waffles using Stella’s buttermilk waffle batter. This batter relies on steam to puff the waffles, so it has a high level of hydration for a light and crisp result. With this batter, we found significant differences in the quality of the waffles made by each iron. Irons that didn't get hot enough weren't able to produce enough steam, resulting in heavy, dense, and soggy waffles, while those that heated up well produced very light and crisp waffles. This batter also benefited the most from the flip mechanism found in some of the irons we tested, likely due to the fact that it's a thinner batter that flows flat into the iron. (The flip design delivers even heating by making sure that a thin batter receives equal contact with the plates on both the top and the bottom.) The waffles resulting from this batter browned more evenly in the flip models than in the stationary ones, with the exception of our high-end picks, the Breville and All-Clad, both of which performed excellently. Ultimately, though, aside from our top-rated flip model, we’d steer you toward our other top picks, including the budget ones, even though they’re stationary: They produced better waffles overall due to higher heat and shorter cook time, despite their uneven browning. For the second round of waffle testing, we used Stella’s overnight yeasted waffle batter. Although this batter also relies on steam to power the rise, the fermentation by the yeast fills the batter with air bubbles even before the creation of steam, so it gets a one-two punch of leavening. This batter was thicker than the buttermilk batter due to the air bubbles it contained, which meant there was no difference between waffles made in a flip waffle maker and those made in a non-flip unit. The same irons that performed poorly due to inadequate heating in the previous test fell short here as well, but with less dramatic results, because steam isn’t the only leavening agent in this batter. Our final round of waffles was made out of Aunt Jemima waffle mix, prepared according to the package’s instructions. These waffles use a combination of chemical leavening and steam from the added liquid to result in the rise of the waffles. The waffles made with this batter were consistently dense and cake-like in all the waffle makers, but the color came out evenly brown in all machines. Where we found variations was in the crispness of the crusts, with machines that were hotter yielding thinner and crispier crusts. With this batter, we also found no differences between flip and non-flip units. If you make waffles mostly with a boxed mix, you can definitely get away with using a cheaper iron, since the differences were closer to minimal. Because waffle irons are more of a kitchen extravagance than an absolute necessity, we decided to test out a few non-waffle items in the machines just for kicks—the more versatile these tools can be, the better. We waffled up some grilled cheese and sage stuffing to see how the machines would do. As we’ve seen in the past, a waffle iron may be the best tool to make things like grilled cheese: The divots become extra crisp, with cheese oozing out and forming a crackling frico, while the peaks remain soft and chewy. The nonstick surface ensures no bits of stuffing or bread are left behind. The results of this test followed the trend of the previous ones, with our high-end picks edging out the rest. With all three batters, as well as our bonus rounds of stuffing and grilled cheese, there was a clear difference in the quality of results between higher-end, more expensive models and lower-end, budget models. The high-end models heated up significantly faster and hotter, and had a much shorter recovery time between waffles. They all have heavier plates than the lower-end models, resulting in even heat and consistent browning. The waffles made in our more expensive models all became deeply browned in under four minutes, while the less expensive models took anywhere from eight to 15 minutes. This resulted in huge variations in the density of the inside and the texture of the exterior of the waffles. That said, the price differences between the high-end and low-end models are also significant, with the budget models ranging between $20 and $60 while the expensive models reached upwards of $125. Even though the budget models we chose as winners did not brown as evenly or result in waffles with near the quality of the expensive models, they still outperformed their peers. Our winning budget models also offer removable, dishwasher-safe plates, making them far easier to clean than our high-end winners, a much-appreciated feature that we feel makes them worth recommending. Most waffle makers also come with a timer or indicator light to tell you the waffle is ready. But in almost all instances, the waffles require more time than the indicators suggest, rendering the feature unhelpful at best and misleading at worst. Electric waffle irons are available in flip and stationary models. Proponents of flip waffle makers suggest that they heat more evenly by better distributing the batter throughout the plates. After testing both styles with different batters to see if this was truly a useful feature, we found that our three high-end picks cooked all the batters on the top and the bottom evenly. There was no difference between our flip model and a high-end stationary model. We did, however, find the flip a useful function when comparing lower-end models cooking the thinner buttermilk batter. Ultimately, we didn't pick any low-end flip models because, although they may have heated more evenly than our budget picks, they cooked the batter so slowly that the waffles ended up too dense and heavy. There was one area in which the flip proved useful, which was creating full waffles with batter that flowed from edge to edge without overflowing the iron. With a stationary model, you’re left to depend on just the weight of the top plate to spread out the batter, which often requires you to overfill it to reach the edges, particularly with square waffles. With a flip model, you also get some help from the rotational movement to distribute the batter, making it easier to completely fill the plates with less batter. The features we found particularly useful were removable plates and drip trays for easy cleanup, as well as cord storage and locking handles, which allow for upright storage. Our winners consistently made the best waffles, ones that browned evenly and quickly and turned out crisp and light. They also had useful features that made them easy to use, clean, and store. What we liked: The Cuisinart waffle maker was the hottest of all the irons we tested, making waffles in just over three minutes. The waffles it produced were light and fluffy on the inside, with a delicate and crisp crust. They had deep divots for holding lots of syrup and butter, and a traditional round shape. Because the iron gets so hot, the adjustable temperature is actually a useful feature, unlike on most of the other waffle irons we tested. This model is also equipped with an on/off switch, which people with large kitchens may find useful, as it makes it easier to keep it set up on a counter without having to unplug after each use (especially helpful if your outlets are in inconvenient places, and repeatedly plugging and unplugging is a hassle). 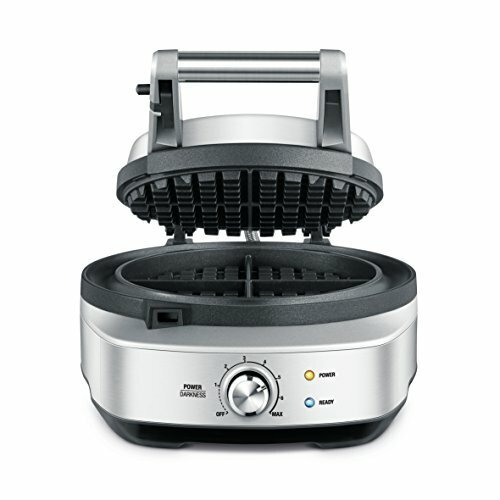 It makes two seven-inch waffles at a time, with a two-minute recovery time, allowing you to make waffles for a crowd. The flip function means it evenly cooks thicker and thinner batters alike and requires less batter to fill edge to edge. What we didn’t like: This is a big and bulky unit, making it a difficult fit in small spaces. Without a drip tray, there is potential for mess. (However, because it's a flip model, you need less batter to fill up the iron, so drips are also less likely.) There was some unevenness in cooking, with the edges browning a touch faster than the rest. The deep wells and fixed plates make cleanup difficult. What we liked: The All-Clad is well built and sturdy, and heats up quickly and evenly for perfectly crisp, light, and consistent waffles. The crunchy, golden waffles made with this model are tall and square, with deep nooks. The All-Clad makes two waffles at a time in under four minutes and reheats fast, requiring just two minutes between batches. It browns evenly along the surface and between the top and the bottom of the waffle, even without a flip mechanism. A drip tray is fitted to the back of the unit to contain spills for easy cleanup. This unit is also compact, as it's equipped with cord storage and locking handles. What we didn’t like: At over $100 (we've seen significant price fluctuations on this unit on Amazon, with a low point of around $125), it's an investment, best for avid waffle fans. What we liked: The Breville made crispy and light American-style waffles in three to four minutes. The waffles made in this model come out round, thin, and crispy, yet manage to maintain a soft interior. Even though it makes only one waffle at a time, the Breville reheats and is ready for another waffle in under two minutes, so it can make a greater quantity of waffles in the same amount of time as many larger models. This model also heated the most evenly of all the brands we tested, both across the surface of the waffle and when comparing the top and bottom. With a built-in drip tray, this unit remains true to its "no mess" name. Equipped with convenient cord storage, a locking handle, and a slim design, it’s easy to store in tight spaces or small kitchens. What we didn’t like: At over $100, this waffle maker is also an investment. What we liked: This large and affordable unit makes four waffles at a time. The square waffles produced by this model don’t feature wells as deep as those of the Cuisinart or All-Clad, but they are chewy and tender, with crispy edges and peaks. The removable, dishwasher-safe plates are our favorite feature, as deeper-welled Belgian-waffle makers can be difficult to clean. This waffle iron is particularly worth considering if you typically use a store-bought waffle mix, which is less sensitive to inconsistent heating than homemade batter. The cord storage and locking handles make the Krups simple to store, even with its large capacity. What we didn’t like: The cooking time and reheating time on this model are slow—about 10 minutes to cook one round and about eight minutes to reheat. The resulting waffles are denser and softer than those made in the high-end waffle irons. We also found that the tops of the waffles from this model are much paler in color than the bottoms. What we liked: This compact and lightweight model from Black+Decker is a great multitasker for any small kitchen. It makes thin waffles with shallow wells, crispy on the outside and slightly chewy on the inside. On average, it makes waffles in about eight minutes—longer than ideal, but still respectable compared with other affordable options. The large surface makes four square four-inch waffles at a time, but it still has a low profile, making it a good fit in tight spaces. 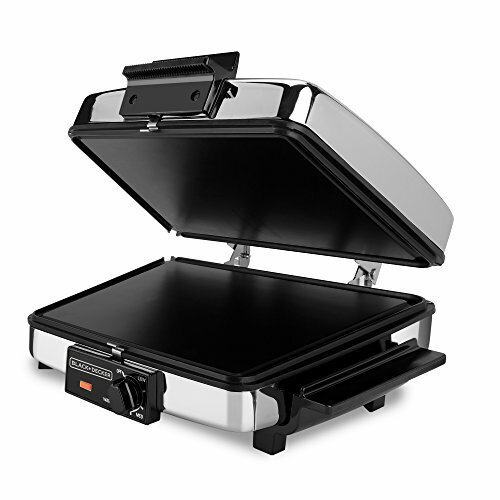 The plates on this unit are reversible, revealing a flat griddle, which opens up into a large cooking surface for eggs and pancakes and can accommodate large sandwiches with its adjustable hinge. The plates are removable and dishwasher-safe. What we didn’t like: This model struggled to heat evenly, often resulting in waffles that were lighter in the center than at the edges. The Chef’sChoice WafflePro Express Waffle Maker comes packed with features, such as a locking handle and cord storage, making it convenient to tuck away upright; two indicator lights; and an on/off switch, allowing you to store the unit plugged in (the only model besides our winning Cuisinart equipped with such a switch). Unfortunately, the waffles it produced were highly uneven in color, with pale edges and one side much darker than the other. The Hamilton Beach Belgian Waffle Maker is a compact and lightweight model featuring indicator lights, variable temperature, and a locking handle. But it never got very hot during our tests, resulting in the batter sticking to the iron. That also meant long cook times, leading to leathery and dense waffles. We also tested the flip model from Hamilton Beach, the Hamilton Beach Flip Belgian Waffle Maker. It has a drip tray and removable plates for easy cleanup, and, although this unit is larger, the handle folds in for easier storage. Similar to the other Hamilton Beach model, though, this unit did not heat up well, which led to sticking and dense waffles. The Oster Belgian Waffle Maker was one of the lowest-priced models we tested. It is small, compact, and lightweight, with minimal features. Despite its slight design, without a locking handle or cord storage, upright storage is difficult. The waffles it produced were pale even after 10 minutes, and they came out dense and soggy as a result. 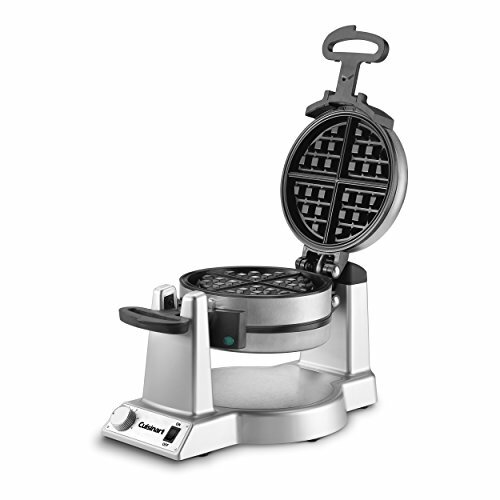 The Oster Flip Nonstick Belgian Waffle Maker nearly made it to the winners' list. Its design is similar to that of the Hamilton Beach, featuring a drip tray for easy cleanup and a folding handle for compact storage. The waffles it produced were evenly browned, but, once again, they required too much time to cook, resulting in dense and soggy waffles. The Presto FlipSide Waffle Maker flips from side to side on a hinge, rather than with a rotary motion, like the other models we tested. It does not feature a locking handle, however, so the side-to-side flipping motion easily leads to spilled batter. The unit heats up quickly but never gets very hot, resulting in a long cook time. It features a one- or two-minute timer to indicate when to flip, but the waffles take upwards of 10 minutes to brown, so each waffle requires frequent beeping. The Proctor Silex Belgian Waffle Maker has a flimsy design and no extra features. Without a cool-touch handle, the entire body of this unit becomes extremely hot, making it difficult to lift the lid. Many of the waffles stuck to the plates, making it hard to clean and use.